The Mary Quinn Mysteries are rather a guilty pleasure for me. I read The Agency: A Spy in the House (linked to my review @ 5M4B) earlier this year. As I expressed then, the first book in the Mary Quinn trilogy has some mature themes in it which makes me not want to hand it over to younger readers, but I have no qualms about recommending to adults. If you want a good, fun, clean mystery, then this book is just right! It's just....well....FUN! I don't really have another word for it. Y.S. Lee tells a good story, which involves eighteen year old Mary Quinn who works for an all-female undercover agency. 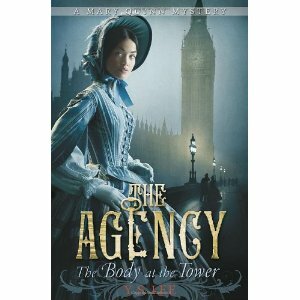 In The Agency 2: The Body at the Tower Mary is recruited to disguise herself as a 12 year old boy who is sent to a construction site (i.e., Big Ben) to discover whether or not there had been a murder on site, or just an unfortunate accident. The story is set in Victorian England so it's a fun setting. (I know I need another word but I tell you I haven't got one!) The romantic interest in the book pops back in (because what would the story be without him?) and being a 30-something reader I didn't care. It's a very, very tame romance. Again, I know there are conservative readers out there and the main thematic element in the book that I didn't care for was the issue of homosexuality which I thought was unnecessary, particularly for this story. Mentioning this in the story came across more as Lee just wanting to say something shocking, rather than adding anything to any of the character's development. Generally, it just lacked in taste although she certainly didn't delve into that subject matter at all. Like I said, it was a surface level mention, designed for shock value. Also, as in the first book, there is a random smattering of foul language which is what makes me personally classify this book right out of YA literature and throws it into the adult category. Despite these things, it is a clean mystery and Y.S. Lee does tell a remarkably good story. So, in the end, I don't mind mentioning it at all. I guess this comes across as a mixed-review. I like these books but there are some issues with it that will not appeal to the more conservative reader and I do want to make sure I point them out to you (so you aren't thinking, "What happened to Carrie?!" if you pick them up.) They have negative aspects. But for me, the positive outweighs that and I'm along for the ride! Thanks, Candlewick, for indulging my love of mystery and giving me a chance to spend some time with Mary Quinn! I didn't think your review was truly mixed...you heartily recommend the books for adults, but you shared your concerns as to what took away from the story and why it is not appropriate for someone 12 years of age. I can only hope that Candlewick Press listens to reviews like this...a fabulous book, but could be even better! And yes, we would be surprised if we read it and you had not mentioned some of those concerns! Looks like a fun story. It's been a long time since I indulged my love for female detective books.